An injured stray dog requires special attention. While it is a legal requirement to report a stray dog, it is also important to ensure that an injured dog is quickly taken to a place where it can not cause itself any more damage. This also ensures that an injured dog cannot cause road or other accidents. Where a dog has a minor injury, such as a small cut or graze, he may quite happily allow himself to be led to a garden or other secure area. If the dog is wearing a collar with identity information his owners can be contacted. If, however, the dog does not have a collar then he must be reported as a stray to the local authority or police. The dog can rest here in safety while waiting to be collected. Sometimes a dog has more severe injuries. He may be unable to move by himself and need help. Before moving a badly injured dog there are some important things to consider. If an injured dog is found on or beside the road, the first thing that many people think of is moving the dog to safety. Before moving an injured dog from the road, however, it is vital that people consider their own safety first. 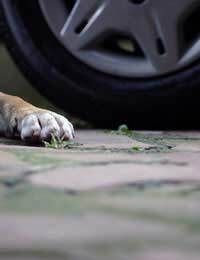 If a dog is found on a fast moving road, the traffic can present a real hazard to someone who is walking onto the road to move an injured dog. A dog should only be moved from the road if someone is completely confident that they can do this with complete safety. If there is any doubt then the police should be called and they will be able to deal with the situation quickly. Even the most placid and friendly of dogs can become aggressive when injured. A dog will be frightened by his injuries and may react by biting people who are trying to help him. Care should be taken before approaching any injured dog, however small or cute it looks, to avoid frightening the dog and causing it to attack. Some injuries are hidden and care should always be taken when moving any injured animal. If in doubt, people should ring an animal welfare organisation or the police for advice. If there is no option other than to move the dog, for instance if he is a hazard to himself or to others, then this should be done with extreme caution so as not to cause further injury to the dog. If a friendly dog is found injured and is taken home, then there are some simple ways of caring for the dog before it is collected by the local authority. One of the most important ways that an injured dog can be cared for is to give him a warm and safe place to rest. It is best to take advice from a vet before giving it food and water, as this might stop him from having certain treatments for a number of hours. Finding and knowing how to deal with an injured dog can help to quickly deal with this situation if it arises with the minimum of stress.